In this example we would like to study the distribution of digits in the number pi (in base 10). While it is not known if pi is a normal number (a number is normal in base 10 if 0-9 occur with equal likelihood) numerical investigations suggest that it is. We will begin with a serial calculation on 10,000 digits of pi and then perform a parallel calculation involving 150 million digits. For the serial calculation, we will use SymPy to calculate 10,000 digits of pi and then look at the frequencies of the digits 0-9. Out of 10,000 digits, we expect each digit to occur 1,000 times. While SymPy is capable of calculating many more digits of pi, our purpose here is to set the stage for the much larger parallel calculation. 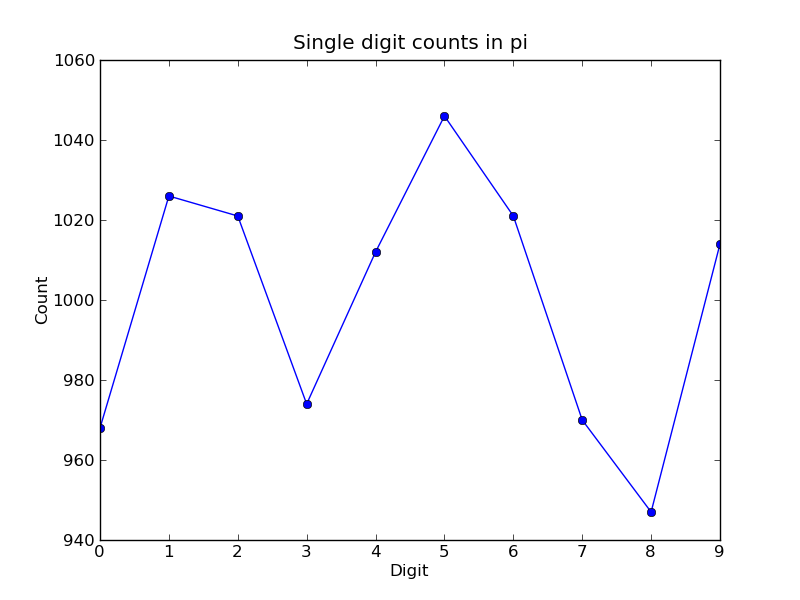 It is clear that to reduce the relative fluctuations in the counts, we need to look at many more digits of pi. That brings us to the parallel calculation. Calculating many digits of pi is a challenging computational problem in itself. Because we want to focus on the distribution of digits in this example, we will use pre-computed digit of pi from the website of Professor Yasumasa Kanada at the University of Tokyo (http://www.super-computing.org). These digits come in a set of text files (ftp://pi.super-computing.org/.2/pi200m/) that each have 10 million digits of pi. For the parallel calculation, we have copied these files to the local hard drives of the compute nodes. A total of 15 of these files will be used, for a total of 150 million digits of pi. To make things a little more interesting we will calculate the frequencies of all 2 digits sequences (00-99) and then plot the result using a 2D matrix in Matplotlib. Read digits of pi from a file and compute the 2 digit frequencies. Add up a list of freq counts to get the total counts. Use ipcluster to start 15 engines. We used 16 cores of an SGE linux cluster (1 controller + 15 engines). With the file parallelpi.py in your current working directory, open up IPython, enable matplotlib, and type run parallelpi.py. This will download the pi files via ftp the first time you run it, if they are not present in the Engines’ working directory. When run on our 16 cores, we observe a speedup of 14.2x. This is slightly less than linear scaling (16x) because the controller is also running on one of the cores. # The Client allows us to use the engines interactively. # Create the list of files to process. # which applies compute_two_digit_freqs to each file in files in parallel. # Add up the frequencies from each engine. The resulting plot generated by Matplotlib is shown below. 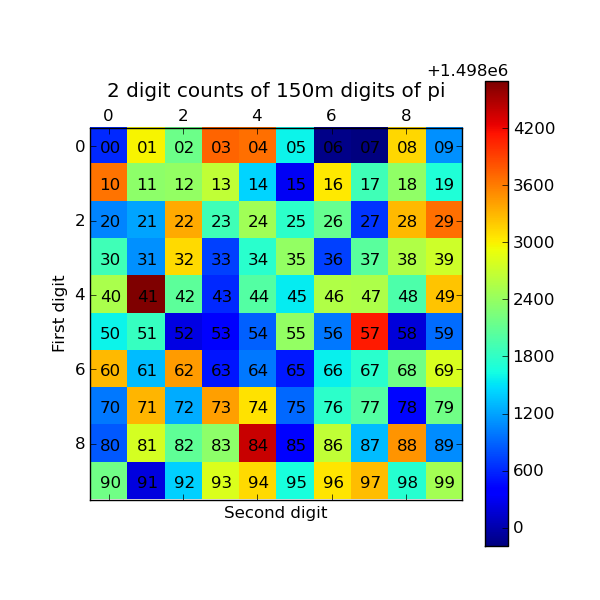 The colors indicate which two digit sequences are more (red) or less (blue) likely to occur in the first 150 million digits of pi. We clearly see that the sequence “41” is most likely and that “06” and “07” are least likely. Further analysis would show that the relative size of the statistical fluctuations have decreased compared to the 10,000 digit calculation. Serial code can be parallelized often with only a few extra lines of code. We have used the DirectView and LoadBalancedView classes for this purpose. The resulting parallel code can be run without ever leaving the IPython’s interactive shell. Any data computed in parallel can be explored interactively through visualization or further numerical calculations. We have run these examples on a cluster running RHEL 5 and Sun GridEngine. IPython’s built in support for SGE (and other batch systems) makes it easy to get started with IPython’s parallel capabilities.